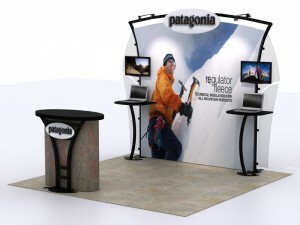 Over the years, I’ve had a bit of an obsession with trade show pop up displays. I started my career working for a pop up manufacturer in the mid-nineties back when pop ups still elicited WOWs! and most fabric units sold for $3600. Back then, I could talk about the idiosyncrasies of one frame vs. another frame, the strengths of one channel bar vs. the competitors, and the nuances of a magnet-to-magnet vs. a magnet-to-metal panel connection. Frankly, we were in a brutal pop up war based on features and benefits, and took delight comparing fiberglass to aluminum, skinny to square tubes, and my favorite, the difference between self-locking to connector-locking frames. Even the cases were part of the daily sales battle. Many customers are not concerned about the features and benefits of pop ups. They are shopping exclusively on price; they want it to last a few shows, and they are less concerned about all the bells and whistles or whether the frame has a lifetime warranty. But they should. Good pop up display systems are amazing. 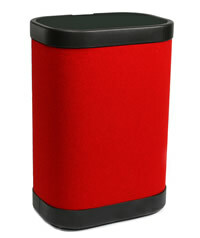 They are versatility, portable, durable, and offer remarkable graphic impart. However . . . Treat Me with Respect. I’ve Earned It. 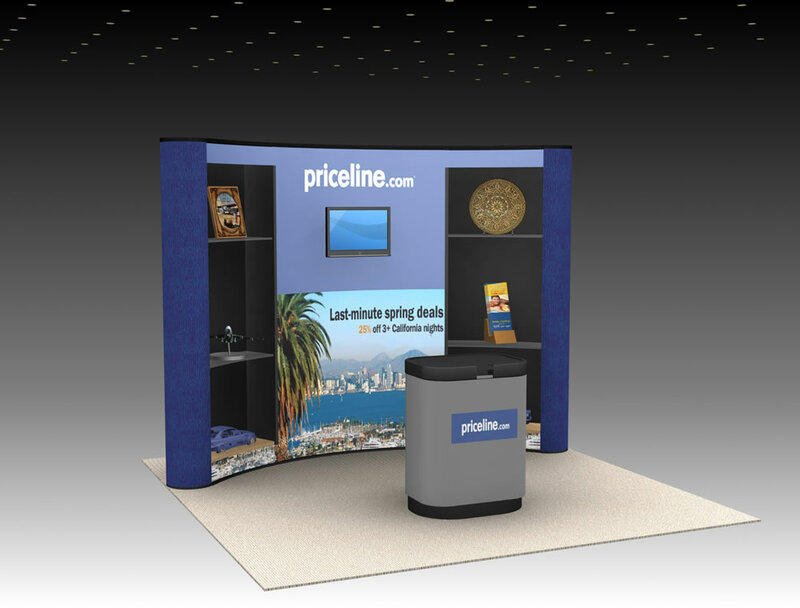 The pop up, once the pride and joy of any portable trade show program, has lost its luster. Where we once treated it like a dress from Saks Fifth Avenue, carefully hanging it in plastic and sending it to the dry cleaners, many now treat it like a skirt and blouse from Ross and wash it with our dirty underwear and towels. They wear it after it has faded. They wear it wrinkled. They wear it after it’s missing buttons. They continue wearing it because it’s comfortable and convenient, not because it’s flattering. You still see pop ups everywhere, but they are often assembled haphazardly, showing their age, or leaning precariously like a hillbilly shack. Frankly, seeing them saddens me because I know, as do you, that pop ups can be attractive and effective displays, particularly when combined with the right accessories, such as shelves, shadowboxes, monitor mounts, and headers. But it’s rare to see them with these accessories since the budget pop ups have all but abandoned them. That’s a mistake. No other display does more than a pop up for the price. No other affordable display has more accessories or more visual impact — dollar for dollar. However . . .
1. The Flapper: A good 50 percent of the pop ups have at least one end panel waving at attendees. Apparently, attaching an end panel has become either too labor intensive for many exhibitors, or to be fair, something has broken making it impossible to attach them. And fixing it is too much trouble. 2. The Old Lady: We are a society obsessed with youth, except when it comes to pop up graphics. Wrinkles, creases, and de-lamination are perfectly acceptable. I’ve seen graphics so battered and abused that I involuntarily looked away in embarrassment. 3. The Hurler: The setup instructions for most pop up displays have apparently changed. You stand 6 feet away from the frame and toss the panels on the channel bars. Wherever they land, that’s where they stay. 4. The Muscle Shirt: Do you have a male relative who wears a sleeveless muscle shirt to every gathering, including Thanksgiving Dinner? This same “dude” was last seen standing in front of a pop up display without end panels. Yes, it’s an acceptable look for tension fabric pop ups like Xpression, but not traditional pop ups. It’s tacky. 5. The Cripple: I know. I know. That term isn’t PC anymore, but we’re talking about a pop up not a person. These pop ups have broken connectors, missing channel bars, bent frames, and snapped hanger pins. Duct tape is visible. Plastic security ties are considered hi-tech repairs. If this was a loved one, you’d give it an overdose of morphine just to put it out of its misery. 6. The Creatively Confused: Now I can’t attest to seeing this, but a distributor told me about it last week. The exhibitor had managed to attach the pop up panels to the convex/reverse side of the curve frame. He then complained that the pop up wasn’t as attractive as the one he’d seen in the showroom. I believe his booth was next to to guy in the muscle shirt, who coached him through the setup. 7. The Just Passing Through: Every pop up exhibitor should purchase the case-to-counter wrap. They’re brilliant and practical particularly when combined with a graphic. But there’s always the booth with just the case . . . the battered, scarred, and naked case holding brochures, business cards, or a fishbowl. This person is so anxious to leave the show that even hiding the case behind the display or converting it to a case-to-counter unit is too much trouble. I’m guessing that Golden Corral once ran out of shrimp when he didn’t arrive by 5:15 pm after a show. Well . . . that will NEVER HAPPEN AGAIN! Perhaps, I’m simply getting sentimental, but I miss those days when pop ups were respected and coddled. I yearn for those exhibitors who carefully put their graphic panels back in the plastic sleeves, and whose eyes widen with wonder the first time they opened the frame. I’m still in awe of pop up displays. They do so much, and the good ones, the really good ones, have the power to transform a simple 10 x 10 space with large graphics, shelves, and a monitor (or two). I still see them on trade show floors. When I do, I can’t help but smile, and invariably, I find myself stepping into the booth and complimenting the exhibitor on their display. 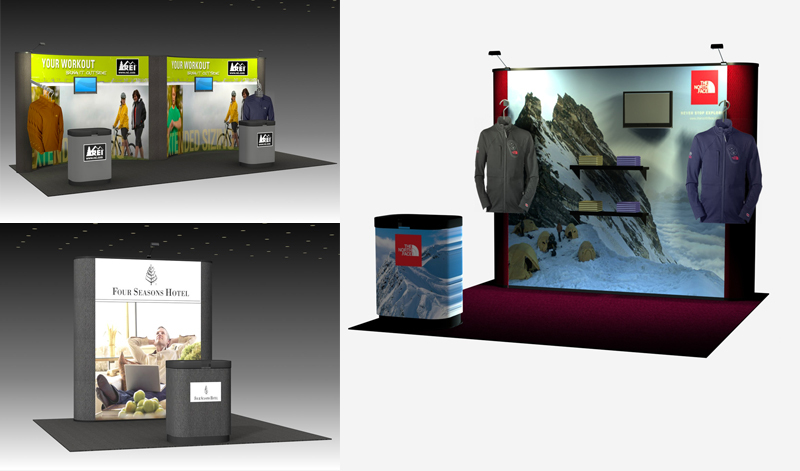 Based in Portland, Oregon, Classic Exhibits Inc. designs and manufacturers portable, modular, and custom-hybrid exhibit solutions. Classic Exhibits products are represented by an extensive distributor network in North America and in select International markets. For more information, contact us at 866-652-2100. Trade Show Displays have evolved in the last decade, and some of the terminology has evolved too, so we thought we’d go over some of the different exhibition stand construction techniques and what those different displays are called. The journey will take a few posts; in today’s article, we’ll start with a review of the venerable pop up display. Pop Up Displays have been around for a long time. They use an expandable accordion frame structure, usually made from aluminum. This frame collapses into about a 20″ square, approx 30″ tall. When expanded, the frame literally “pops up” into place, hence the name “Pop Up Display”. Separate magnetic bars are hung in front of the frame, using hooks that attach to the top of the frame, and latches that attach to the hubs in front too. Then panels with magnetic strips on the sides and hooks on top are attached; these panels are roll-able, so they can store in the shipping case, and historically have held either Velcro-receptive fabric or printed and laminated mural graphics on the front of the panels. Construction for pop up displays varies a little from one manufacturer to the next, using slightly different hubs and scissor arms, and offering different accessories. The frames can look almost identical to the casual eye, and sometimes even to an experienced eye. However, there is a range of quality that buyers should be aware of. The least expensive pop up stands are seemingly only intended for a few uses, because the plastic hubs and scissor arms break or bend pretty quickly. More durable pop up display stands use better engineering and stronger parts, and normally come with a lifetime hardware warranty. 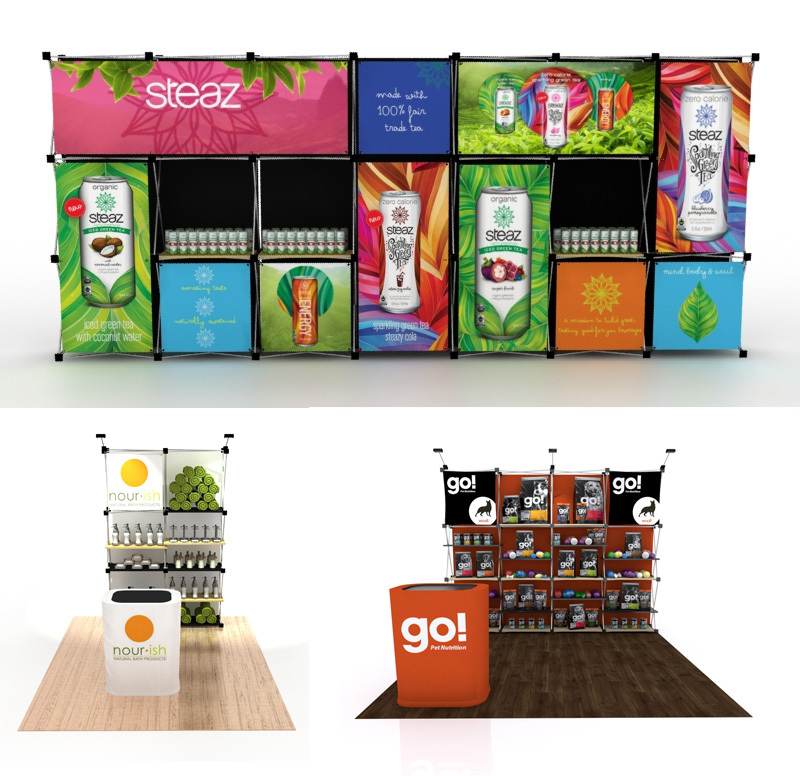 Pop up display stands are available in 6ft, 8ft, 10ft, and 20ft widths, normally 8ft tall, to fit almost every trade show booth size requirement. They are also available in shorter, table top sizes. In these different widths, they are offered in a concave curve, a flat shape, and also as a serpentine or “S” shape. Some designs, particularly the floor height flat designs, offer side wall returns too. These different shapes can be combined, as illustrated in the rendering above, which shows a 10ft concave attached to a 10ft flat, with a 3ft side wall return. 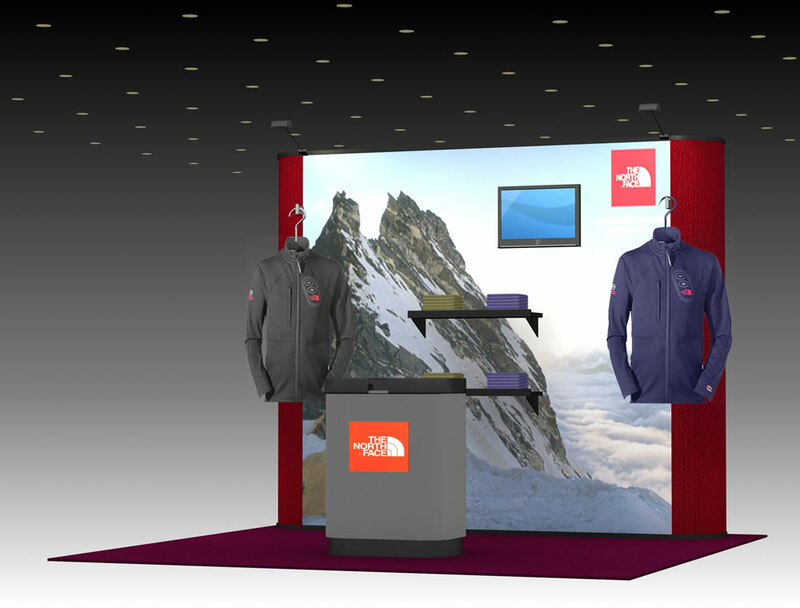 Pop up display designs can combine fabric panels and laminated graphics. Most of the higher quality designs offer a variety of accessories; starting with monitor mounts and lights, but also including shelves, shadow boxes and internal lighting, as shown in the rendering above. Shipping cases are often ordered with case wraps, covering them with either a fabric wrap or a printed graphic, to convert the shipping case into a podium to be used at your show. 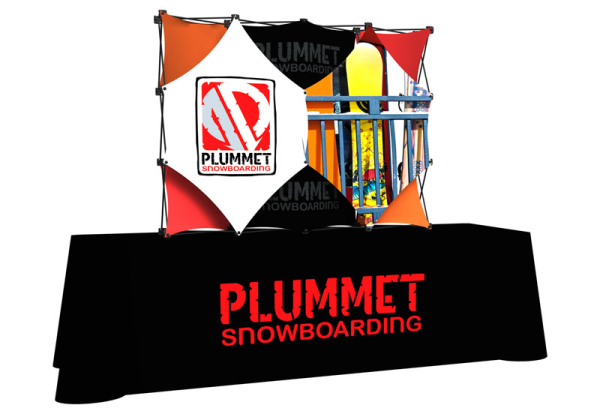 A variation on the pop up display was released a few years ago, and combines the pop up display frame with tension fabric graphics. One of the best known examples of this pop up display is called the Burst or VBurst display. As with the standard pop up displays, this new style pop up booth uses an accordion-like frame, with a single dye sublimation printed fabric graphic. The graphic is mounted with Velcro to the frame, and normally stays in place on the frame, even while disassembled. This reduces the set-up time for this style of pop up display from 15 minutes or so to one or two minutes — greatly appreciated by exhibitors! The tension fabric graphic on the Burst pop up displays can come with or without side panels, and, while it is normally left in place, it can be quickly removed to swap out graphics. It can also be tossed into a washing machine, gentle cycle, if it becomes soiled. If these tension fabric graphics are left folded up in the case for too long between shows, the fabric can get a little wrinkled, but the fabric is designed to be wrinkle resistant, and bringing a long a portable steamer solves the problem in just a few minutes. The Burst comes in a variety of different sizes and shapes, including table top displays and floor standing displays, flat and curved, with or without graphic side walls. Because of its instantaneous setup, it is very popular with sports teams, governments, schools, and media outlets that frequently make press releases — 2 minutes and you’ve got a graphic back drop for your TV appearance or photo opportunity! 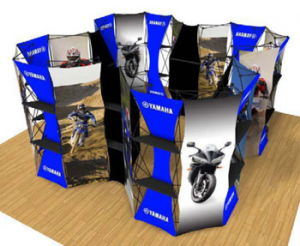 As with the standard pop up display, there are many manufacturers that claim to make tension fabric pop up displays that are identical to the Burst. Comparing the different products reveals that some of the frames are easy to break, and the best ones, like the Burst, come with a lifetime hardware warranty. Similarly, the fabric graphic is difficult to get exactly right — some of the less expensive knock-offs use fabric that wrinkles a lot more quickly and never ever seems to get rid of the wrinkles. As with the standard pop up display stands, the Burst shipping cases are available with graphic wraps, so the cases can be converted into podiums. Another recent variation on the standard pop up display is called an Xpressions display. This system also uses an accordion-like frame combined with tension fabric graphics, but uses a lighter weight frame than standard pop ups. The Xpressions frames come in a wide variety of configurations. Each square formed by the frame is called a quad, and there are 3 quad triangular designs, 1×3 vertical towers, 2×3’s, 3x3s, 3x4s, 4x4s, etc. The most innovative part of the Xpressions displays is the use of multiple graphic skins, which can be attached by buttons to either the front or back of the special Xpressions frames. Multiple skins allows quick changes to individual skins, showing a different product for different clients. Attaching the graphic to the front and back allows some 3D effects, creating different and unique looks for the displays. Like the Burst, the Xpressions display system also allows the graphic skin to remain on the frame while collapsed. And like the Burst, the Xpressions frame sets up in seconds, and can be stored in a shipping case that converts to a podium. Also like the Burst, the Xpressions is available in both table top and floor standing designs; the table top version uses a smaller frame size, allowing Xpressions Salesmate table top pop up displays to fit into smaller carry bags for easy use in spur of the moment presentations. The multiple skin graphics on the Xpressions allows a great deal more innovation, in graphics, and also in the hardware, and the manufacturer has been releasing some very intriguing accessories and modifications to the Xpressions displays recently. Both the floor standing and the table top frame sizes offer square graphic skins, rectangular graphics, and diamond shaped skins; all of these can attach in front, in back, or can be stretched from front to back, creating a variety of 3 dimensional effects. More recent innovations include adding sheer transparent skins (for more 3D effects), backlit skins (LED lighting behind them), and most recently, special adapters and connectors that allow angled connections. This new feature, called Connex, allows users to create some fantastic new circular backwalls and towers – even round rooms. The graphic skins can still be squares, larger rectangles, or diamonds, and can also include the sheer skin and backlit skin options used on other Xpressions displays. With the new Xpressions Connex pop up displays, the only limit is your imagination! This completes our review of the Pop Up Trade Show Display category. As noted, the common factor is the accordion-like, “pop up frame” that all of these systems use. 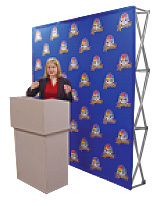 The standard pop up stands use roll-able, heavier fabric or laminated graphic panels. These are still very reliable choices for displays — a client two years ago purchased five Quadro S Pop Up Displays, and last month told us that they’ve been to 75 shows so far with no visible wear and tear! 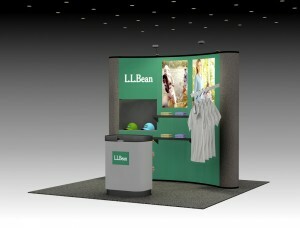 Newer style pop ups include the Burst and the Xpressions display systems. These feature fabric graphics instead of roll-able panels, making these newer systems a little lighter; since the graphic skins stay on the collapsed displays, setup and take-down is very quick. Whatever pop up display works best, you can find all the details and choices on our Pop Up Display web page. 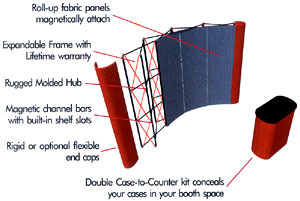 Next post, we’ll review the evolution of Panel Displays, before delving into Modular and Hybrid trade show displays. 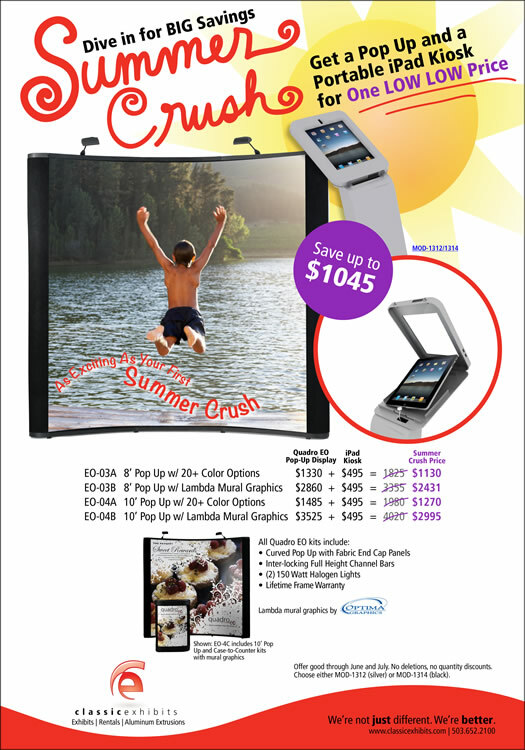 The Summer Crush Specials feature the Quadro EO Pop Up combined with the newly released iPad Kiosks MOD-1312 and MOD-1314. The savings are ginormous. Literally GINORMOUS! Download the unbranded Summer Crush PDF. Those who saw the units at EXHIBITOR 2012 know that the Classic iPad Kiosks are the real deal. 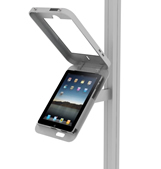 They combine function and value never before seen in an iPad kiosk with a lockable clamshell case, integrated wire management, an internal power strip, and powder-coated steel and aluminum construction. Plus, it wouldn’t be a Classic without accessory options like graphic wings, graphic clamshell halos, literature holders, and a nifty keyboard shelf. Check out the links below to see all the great options. But my personal favorite . . . the clamshell case with an extrusion connection similar to how Literature Brochures attach to our hybrid systems. This gives you the ability to add an iPad to any new or existing hybrid inline or island from Classic Exhibits (and a competing extrusion line as well). Kudos to Mike Swartout for the great demo video. Pay special attention to the cool theme music. I love it!! See the details in the Exhibit Specials gallery. But like all summer crushes, this one is 2 Good 2 Last 4 Ever. For the iPad Kiosk Product Sheet and Price List, click on the links. The Sochi Winter Olympics is just around the corner. We love watching the competition — who wins, who loses, and the inspiring stories about athletes who participate but do not win a gold, a silver, or a bronze medal. Athletes want to win, even if they know it’s a long shot, so they plan, prepare, and train for a chance to stand on the podium. No one prepares for the Olympics just to win a participation trophy. Trade shows are no different. For anyone new to trade show marketing, here’s an important tip no one’s ever going to share with you (except me). You can waste LOTS and LOTS of MONEY participating in trade shows if you don’t know what you’re doing. I don’t care how smart you are. You are going to make mistakes. Lots of them, but the key is to minimize them from the get-go. The trick — learn from the folks who have already made those mistakes and who have stubbed their toe(s) more times than they want to be reminded. Here’s what they’ll tell you. #1. What’s Your Goal. Why are you participating in a trade show? To build the brand, increase sales, meet new customers, find new markets. All are legitimate reasons to exhibit at a show. Bad reasons . . . Going on a whim, because it sounds like a good idea, or because your dog Rex tells you to go (What a bad boy!). Without a goal you have no way of measuring your success. Get a goal. Write it down and share it with your team. Then and only then should you consider trade show marketing. #2. What’s Your Budget. If you say, I don’t know then fold up your tent and go home. The number doesn’t matter, except as a baseline for what you can and can’t do. It’s all relative. $10,000 will get you one thing . . . . $250,000 will get you something else. #3. Do Some Preliminary Research. It’s easy. It’s called Google. Is it going to confuse you? Hell yes. You’ll see stupid numbers like $79 for a banner stand and $1.5 million for a custom exhibit. Imagine walking into a new car lot not having seen or driven a car before. You need a point of reference, but you don’t need to be an expert. That’s impossible. You just need to get a sense of what’s on the market and how much displays cost. That’s it. #4. Work with a Seasoned Exhibit Professional. Why? Why not! I’ve never met anyone in this business who wants a customer to buy the wrong display. You’ve got a budget, right? That will narrow the choices. During the initial meetings, an exhibit consultant will spend more time talking to you about your goals, your message, and your shows than they will about what display to buy. The display is important, but it’s simply a tool. They want you to succeed. Then you’ll come back and buy more. Yippee! It’s a win-win. #5 What Shows. Now you may already know which show(s) you must attend. Every industry has a trade show. That’s the first step but hardly the only step. Are their other shows you should attend because you want to expand into other markets? How about local shows where all you need is a table top display or a pop up. Ask your vendors which shows they attend. Or use one of many online tools like the www.thetradeshowcalendar.com. Or, here’s a thought — ask your exhibit professional to assist you. #6. Plan, Plan, Plan. I know. It’s boring. But, apart from identifying your trade show marketing goals, nothing is more important. You need to put in the work. You need to complete the required paperwork on time. You need to conduct pre-show marketing to get potential clients to your booth. You need to create a project list and check and double-check every last detail. You’ve heard it a million times, but this time it’s true: Fail to plan, then plan to fail. Planning makes the difference between pouring money down a rat-hole and complaining that trade shows don’t work and becoming the next CEO of your company. Well, that may be a little exaggeration (but not much). #7. Who’s Going to the Show. Working the booth is neither a punishment nor a vacation. It’s a job. There’s no in-between. The folks who work the booth have to understand that. They must know the products and services, possess outstanding customer service skills, and be willing to meet clients before, during, and after the show. They must know the difference between entertaining clients and a felony. They must understand the distinction between social drinking and detox. If they don’t, no matter how charming they are, leave them home. and services. Who handles which product line? Who’s the expert on specific services? Who greets clients as they enter the booth? How do you plan to handle leads? Are there meetings and presentations in the booth space? Who cleans in the morning? Who cleans in the evening? How do you handle competitors who enter your booth? There’s a lot of questions and situations that can happen during a one to three day trade show. Do not leave them to chance! #9. Leads. Treat them like a credit card. You never know if the limit is $500 or if you found an American Express Platinum with no limit. There are really three keys to managing leads. First, qualify the lead and take lots and lots of notes. 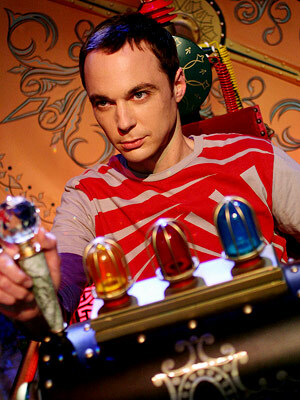 You may think you have an eidetic memory, but trust me, unless you are Sheldon Cooper on The Big Bang Theory, you don’t. All the details you capture only increase your odds exponentially of making a sale. Knowledge is power on the trade show floor. Second, review the leads with the team at the end of the day. Don’t leave the booth and head for the bar UNTIL you’ve reviewed every single lead. Those that need immediate action should be handed to the right person that day. Third, they are sales leads, not confetti. Too many companies treat them like scraps of paper which can be tossed at the end of the show. How you treat leads tells the potential customer everything about your company. #10. Post-show Analysis. All too often, when the show is over, the show is over until next year. Big mistake. We learn from our successes and our failures. The trade show team should conduct a “post-show” review within a week. These ideas need to be captured and recorded so the lessons learned can be implemented at the next show. Even better, meet with your trade show consultant as well. He/she can offer advice based on their experience with other clients and show you how you can improve your trade show marketing and save money. Don’t be shy. 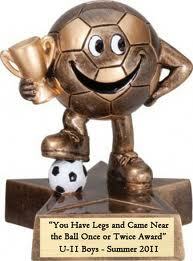 Put in the effort and plan ahead and you will be standing on the podium wearing a little gold.